Welcome to Smoky Ridges, the mountain cabin getaway you’ve been looking for. Located in the heart of North Georgia’s highest peaks, you are close to a multitude of area attractions and activities. Whether you are looking for golf, fishing, hiking, boating, shopping, and dining, you can find opportunities for everyone to enjoy. 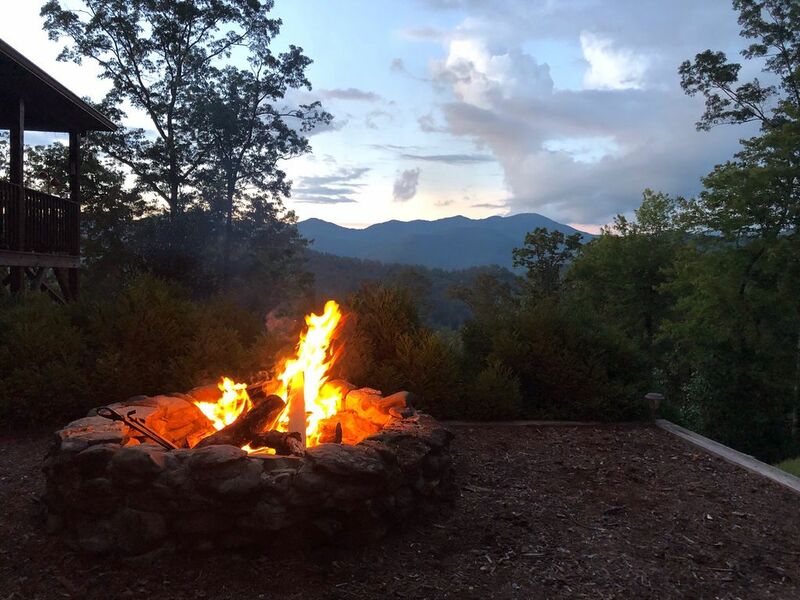 And once you complete your day out, you can come home and relax to stunning long range views of the smoky mountains and all the warmth and charm a cozy mountain cabin has to offer. Tastefully furnished and attractively landscaped, Smoky Ridges offers an open floor plan for the time to gather as well as two large private bedrooms and a loft that comfortably sleeps six. Sit by a fire inside or out, and enjoy the outdoors in any season with a fully covered wrap-around deck. Cool spring mornings, pleasant summer days, glorious autumn colors, or snow covered peaks, you are sure to be pleased with your stay in any season. Cabin Features: Smoky Ridges features approximately 1450 finished square feet of large, spacious rooms on two floors that easily accommodates six adults. The first floor includes the fully furnished kitchen that opens to the dining room and living area. The living area includes a full couch, love seat, and recliner along with satelite TV and a wood burning fireplace. The first floor bedroom features a queen bed, dresser/mirror, chest, large closet, TV, and is adjacent to the first floor bath and laundry room. Upstairs include the master suite with queen bed, dresser/mirror, chest, walk-in closet, and TV. The master bath includes jetted tub and separate shower. The upstairs loft is open to the below living area and features dormer window views of the mountains. It includes a queen sleeper sofa and ample sitting space. The outside features a large, spacious wrap-around deck complete with grill and outdoor sitting. Enjoy the nights by the huge adjacent fire pit. Internet and phone are included. Area Attractions and Activities: The region of Northeast Georgia and Western North Carolina offers a huge variety of attractions and activities for all ages. Hiawassee is 6 miles to the west, and is surrounded by Lake Chatuge with numerous marinas and water sport activities. Lake Burton is only 7 miles east. Nearby rivers offering rafting and fly fishing are the Tallulah, Chatooga, Toccoa, Nantahala, and Hiawassee. Shopping and dining can be found in all nearby towns of Young Harris, Helen, Blairsville, and Clayton Georgia as well as Hayesville, Murphy, and Frankilin North Carolina. Brasstown Bald, the highest peak in Georgia at an elevation of 4,787 feet, offers a complete360 degree observation view of 4 states as well as exhibits and presentations. The region offers seasonal art shows and fairs and all the sightseeing you can imagine. The hearty can take to the Appalachian Trail, where you can find the access trailhead only 1.7 miles from the cabin, or the national forest which is the cabins backyard! Take U.S. Highway 76 East toward Clayton. Once you pass the GA. State 75 intersection, go 6 miles. John Deere Lane will be located on the right. It can easily be identified with a large open field surrounded by a brown wooden fence bordering the highway. Take John Deere Lane to the first left hand fork. Cabin is at the top of the ridge on the right. At the red light intersection of U.S. 76 and U.S. 23/441, take U.S. 76 West toward Hiawassee. Go 17.3 miles to John Deere Lane on your left. Additionally, once you enter Towns County and pass the Appalachian Trail, John Deere Lane will be 1.7 miles on the left. Flatscreen in family room and each bedroom. We had a wonderful stay here over New Years. It’s a very cozy cottage with everything that you could possibly need and very clean too. We forgot coffee filters and luckily enough, the hosts were close by and they brought us some which we really appreciated. We lit a fire every night and sat around it talking and reading our books. We sat at the balcony outside and painted with the kids and just breathed in the fresh mountain air. We hiked up the Appalachian trail which is 5-7 minutes by car from the house - a wonderful hike! Thank you for the lovely stay! The property and view are beautiful. Liz was so nice and accomadating that it felt like we were staying at the cabin of a family member. It’s equipped with everything you need and the location is great. We spent the entire week of Thanksgiving and nobody wanted to leave. I highly recommend renting this cabin, especially knowing it won’t be available forever. Beautifully situated immaculately clean home in private area 8 miles from Hiawassee. Lovely and such an incredible view. Everything met our expectations and then some. Wouldn’t change anything about the house but the driveway was a bit steep. The owners were very nice and changed my time when I had a problem. View, cabin and people were extraordinary. Would definitely go again. Smoky Ridges is a short 6 miles east of Hiawassee, Georgia in the Southern Appalachian Mountains of Northeast Georgia and Western North Carolina. Hiawassee is located on U.S. Highway 76, the main travel corridor across North Georgia. Other nearby towns that are within 5 to 25 miles are Young Harris, Clayton, Helen, Blairsville, Georgia and Hayesville, N.C. Franklin and Murphy North Carolina are approximately 40 miles away. Attractions and activities abound in this region, including resort golf and spa as well as boating and skiing on Lake Chatuge and Lake Burton. Nearby mountain rivers offering fly fishing and rafting are the Toccoa, Tallulah, Chatooga, Nantahala, and Hiawassee. Sightseeing, hiking, horseback riding, seasonal fairs and art festivals, shopping, and dining can be found throughout the region. Brasstown Bald, the highest elevation in Georgia at 4,787 feet, offers an observation that spans four states as well as numerous exhibits and presentations. Holiday rates are not listed, please call for rates. 3 night minimum.